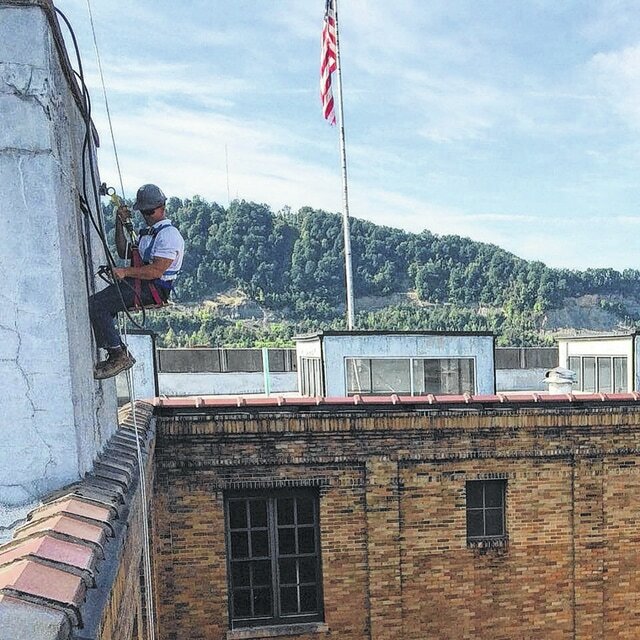 Wayne Allen | Daily Times Late last week maintenance supervisor Phil LaJoye could be found hanging from a harness, sandblasting part of the roof of the Scioto County Courthouse. Maintenance crews inside the Scioto County Courthouse spent countless hours since 2014 working to restore the building as the crown jewel of county government. Late last week, Maintenance Supervisor Phil LaJoye could be found hanging from a harness, sandblasting part of the roof of the courthouse. Scioto County Commissioner Bryan Davis said LaJoye and his staff were sandblasting elevator machinery rooms. “The idea is when that is done they will paint it with a sealer, which is the same color as the building itself,” Davis said. Commissioners Mike Crabtree and Doug Coleman said from the street, someone could tell the machinery rooms needed painting. Crabtree said LaJoye and his crew will first work to remove the paint and then paint them with a long lasting paint. Coleman said he would be in favor of painting an American Flag on the rooms visual from the street. Crabtree acknowledged there has been a recent emphasis on restoring pasts of the building that’s not gotten the attention it needed. “A lot of it has been necessary repairs,” Crabtree said. He used the example of the roof. The commissioners had the roof of the courthouse replaced in 2014 to fix leaks and prevent further damage. Over the years the leaking roof and other factors degraded the fourth floor uninhabitable. Once the roof was fixed, the remains of the former Scioto County Jail were removed from the fourth floor. Once completed, over 200,000 pounds of steel were removed from that space. The fourth floor has become a storage area for records. When offices run out of room to store records some are taken to the fourth floor for storage. The commissioners are working on a plan to address the counties lack of storage for mandated records. The leaking roof and other factors contributed to the damage on the fourth floor, but damage was beginning to show up on lower floors of the structure. Crabtree, Davis, and Coleman said they are working on a plan to address damage in the law library and other places in the building. Crabtree said the improvements not only make the building look better, but also makes the building a safer work environment for county employees. “We’re trying to make things safer, look better and take a little more pride in our courthouse,” Crabtree said. He said LaJoye and his crew, restored the doors coming into the courthouse, spent hundreds of hours on the lobby floor, polishing and removing the lasting remains of the snack bar that used to be there. The commissioners acknowledged that as work continues, they will look for ways to fund further rehabilitation efforts.